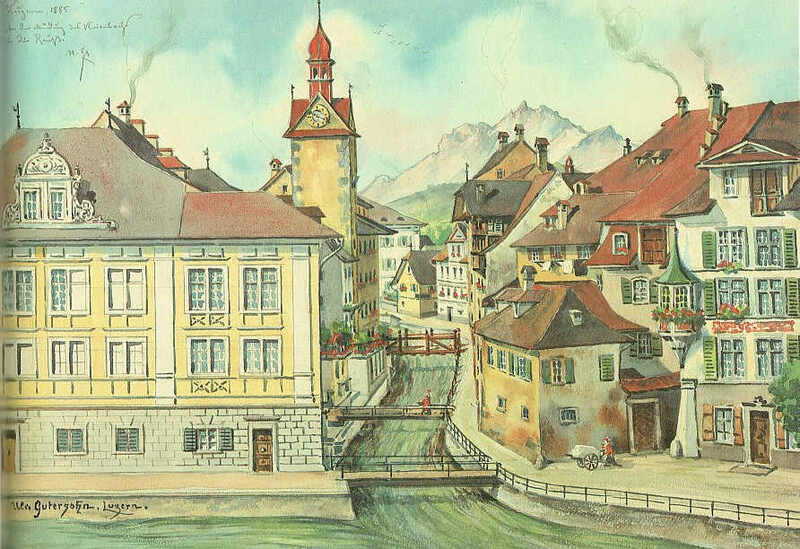 The painting "Corporations Building (or Sonnenberghaus)" by Ulrich Gutersohn dates from 1885 and shows the view on the left bank of the river Reuss. The painter must have stood either on the Zöpfli square or on the needle dam when he painted this art piece. On the left in the foreground you can see the 17th century patrician house of the Sonnenberg family, today's building of the Corporation of the City of Lucerne. It is built in the style of French baroque and is considered one of the most beautiful Lucerne patrician houses of the time. In the center of the picture you can see the then still open Krienbach creek, which used to lead to great flooding in the past. Today the Krienbach is covered with the Burgerstrasse street and largely diverted. 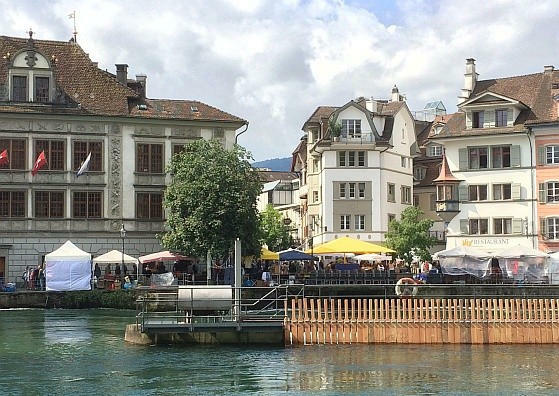 From the Zöpfli square you can still see how the Krienbach flows into the Reuss under the Burgerstrasse. Behind the Sonnenberghaus you can see the Burgerturm tower, demolished in 1864. It was once part of the inner fortification ring. The building in white at the very end of the Krienbach is the Krienbachschulhaus, a school house built the middle of the 19th century. The last of the three bridges in the picture is the Krienbrücke Bridge. To the right of the Krienbrücke, a few steps towards the river Reuss you see the house of the mill with the special construction in the house gable. The probably retrofitted part of the building is spatially slightly offset and does not follow the house line. On the right part of the picture you can see a beautiful oriel, which belongs to the Restaurant Nix zur Laterne. In the background you can see Mount Pilatus, where the Krienbach creek springs.